Well, it’s official now coz I’ve got a name tag. 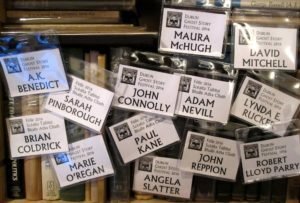 Am very much looking forward to the Dublin Ghost Story Festival! This entry was posted in News and tagged A.K. Benedict, angela slatter, Brian Coldrick, Dublin Ghost Story Festival, john connolly, John Reppion. Sarah Pinborough, lynda e rucker, Marie O'Regan David Mitchell, Maura McHugh, Swan River Press. Bookmark the permalink.